The Chiefs went up two touchdowns with just over eight minutes left in the fourth quarter Thursday night, on a Damien Williams one-yard plunge to cap a 13-play drive. They’d put together three 10-play drives in the game to that point, and the drive they’d just wrapped covered 73 yards and almost eight minutes of clock, and that appeared to be it. The Chargers struck back with a touchdown drive of their own, but it took more than four minutes to hit pay dirt, and though it was impressive I have to tell you I still thought Philip Rivers and his pals were cooked. But the subsequent Chiefs possession was their worst of the night—a three-and-out that lost five total yards and ended with a collapsed pocket on third-and-long and a clutch sack by Melvin Ingram and Isaac Rochell. That was just their second sack of Patrick Mahomes, but it could not have come at a better time—the Chargers would get the ball back with a timeout left and the two minute warning still ahead of them, which is about as much as they could’ve hoped for coming into that stand. Okay, so it would’ve been more climactic if there’d been a defender within shouting distance. There appeared to be some confusion between Fuller and his teammates—you can see Fuller jumping up and down in anguish as the ball sails to Williams, just completely uncovered in the end zone. Afterwards an extremely hoarse Rivers told the assembled media the two-point play was the same play they ran in the second quarter, when Williams caught his first of three touchdowns, but they “dressed it up a little bit” the second time and may have confused the coverage by sending Benjamin in motion. 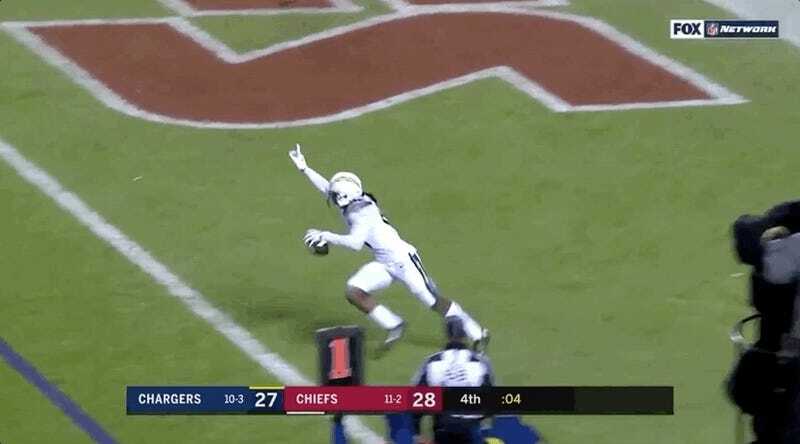 Whatever the hell happened there, the result was Williams standing alone in acres of space and hauling in the game-winning two-point conversion. The win pushed the Chargers into a tie with the Chiefs for the AFC’s best record, and earned them a playoff berth. Rad.